Do you know Purevpn.com? Please tell us your experience and write a short review here. Launched in 2006, PureVPN has emerged as one of the leading Virtual Private Network providers on the market. In fact, such is its popularity that the company currently boasts more than 10,000 active subscribers and throughout the years, the service has earned a strong reputation for its fast connection speeds and overall professionalism. Alongside its more traditional VPN service, PureVPN has also developed its own Smart DNS technology. Smart DNS is ideal for allowing customers to access region-specific online video content, as many video websites have attempted to block conventional VPN traffic. As with similar services, PureVPN’s version of Smart DNS works by re-routing a customer’s DNS queries through servers within their network, located in various places around the world. The result is that the user’s true location is masked and they appear to be accessing the internet from the location of the server they are connected to. Although Smart DNS and VPN services share many similarities, there are a number of key differences. Unlike with a VPN, Smart DNS does not encrypt internet traffic or make users anonymous. However, Smart DNS is generally able to achieve a faster internet connection, which makes it better suited for streaming video content. At present, PureVPN Smart DNS is not available as a stand alone product and only comes as part of the main VPN product. On a monthly basis, subscription to this service costs $9.95, which is expensive if a customer is only interested in the Smart DNS aspect, but reasonable when you consider the full package. 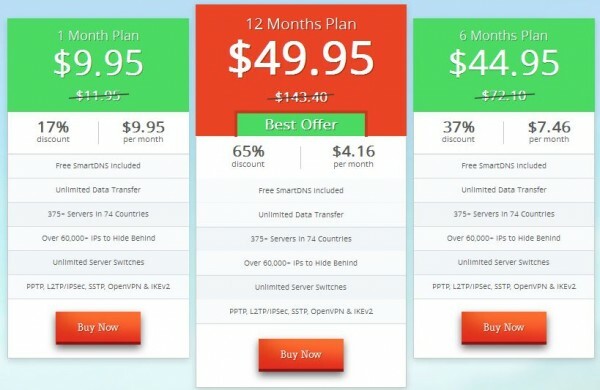 That said, discounts are available for long term subscriptions, with the 6 month plan costing $44.95 ($7.46 per month) and the 12 month plan coming to $49.95 ($4.16 per month). Therefore, it is possible to get the Smart DNS for an extremely competitive price. Additionally, a three day money back guarantee is on offer. In terms of financial transactions, PureVPN accept a huge variety of payment methods, including credit cards, debit cards, PayPal, mobile payment, Bitcoin and Ukash. Another particularly strong aspect of the PureVPN Smart DNS product comes in the form of its customer support, with a live chat feature on the website ensuring support is available 24 hours a day, seven days a week. Unlike some competitors, this chat feature is available prior to registration, meaning questions can be answered before purchase. Further support can be found on the website itself, with a variety of tutorials and information pages answering the most common questions, solving the most common issues and discussing the most common concerns. I signed up for PureVPN for their SmartDNS services which claimed to support Hulu, ABC, etc. It worked for the first week or so, but has now stopped working and I’m past their refund period. Tech support is very inexperienced and they do not carefully read what I’ve already tried and continue to have me repeat tasks. If only they can get this to work. I got drawn to them because they had a New Years special which got me 2-years of VPN and SmartDNS for the price of one (49.95 USD).